At Canteen Creek here we live, there are cheeky dogs everywhere. Mum gets frustrated by the cheeky dogs hanging around the cap and tries to shoo them away – but Grandpa says they help to keep the other cheeky animals away. When the rains come, so too do the other animals – first a gang of goats then a drove of donkeys, followed by horses, buffaloes and camels. Finally, everyone has had enough – especially the cheeky dogs, who growl at the cheeky animals until they go home. Now the cheeky dogs have the camp to themselves – untilt he enxt time the big rains come. 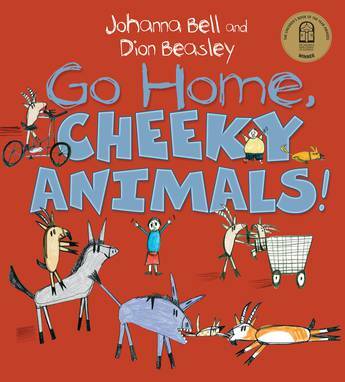 Go Home Cheeky Animals is humorous, delightful book filled with cheeky dogs and, of course, the other cheeky animals, getting into all sorts of mischief around the camp. Kids will love the story but will especially connect with the illustrative style of Dion Beasley whose work is really accessible and simple – yet filled with life, humour and detail. Children from remote indigenous communities are offered a story here which connects with camp life, while kids form other parts of Australia will enjoy the insight Go Home Cheeky Animals offers, alongside its humour. To learn more about the collaboration behind this book and its predecessor, Too Many Cheeky DOgs, visit the creators’ website here. 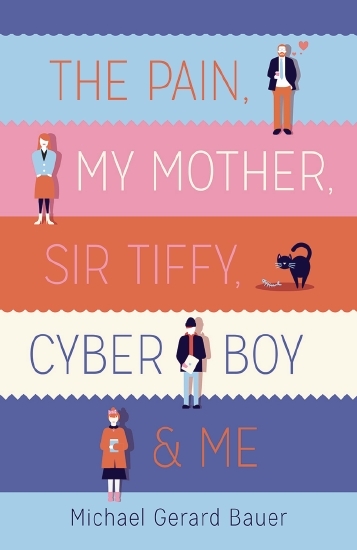 Available from good bookstores or online from Booktopia. Buying through this link supports Aussiereviews. The animals on Farmer Hayden’s farm talked a lot at night. With all the animals on the farm making so much noise every night, Farmer Hayden is struggling to get any sleep. He calls out to the animals to be quiet – but it’s no good, because they are making so much noise they can’t hear him. Finally, on the verge of giving up, Farmer Hayden goes outside to sit on his verandah. As he looks out across the farm., he sees his sheep jumping a fence. he starts to count them. Soon, Farmer Hayden and all the animals are fast asleep. Noisy Nights is a humorous picture book title featuring lots of farm favourites, and noises which youngsters will enjoy echoing. The solution, too, will bring smiles, with its play on the old idea of counting sheep to get to sleep. The illustrations, using water colour with pencil outlines are also filled with gentle humour. Koala has had enough. Ever since European explorers first visited Australia, he has been called a bear. And he’s sick of it. If those first explorers ahd done their research, they’d have known that koalas, like kangaroos and wombats, are marsupials. Don’t Call Me Bear! 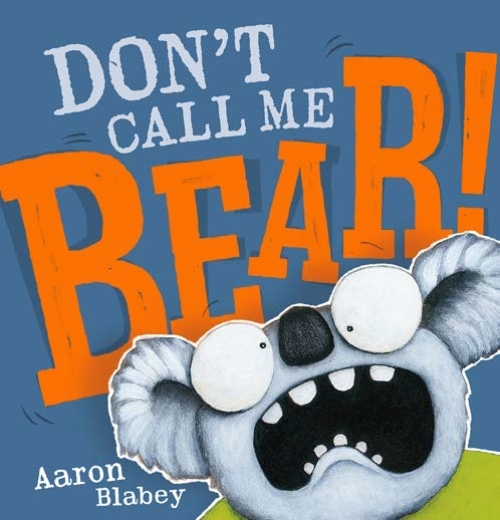 is a humorous rhyming picture book about Koala’s frustration. 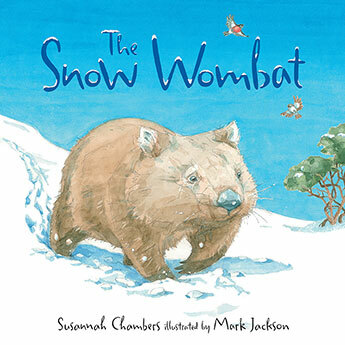 There is a gently educational element, but really the focus is on humour, especially with the other marsupials concluding the book by telling Koala that he looks like a bear. From the creator of books such as Pig the Pug and Piranhas Don’t Eat Bananas, will be similarly enjoyed. Maybe it would be soft like his mother’s fur. He waited with his legs curled high. Maybe it would be firm like his father’s hug. he waited with his head tucked low. Maybe it would be sweet like fresh woodland grass. Little Bear waited and waited…nothing happened. It is time for Little Bear’s first big witer sleep. His moother and father fall asleep quickly, but Little Bear is wide awake. What will the big sleep feel like? And what will happen if he can’t get to sleep? He tries all kinds of positions, but it is only when he snuggles in close to his parents that sleep finally finds him. 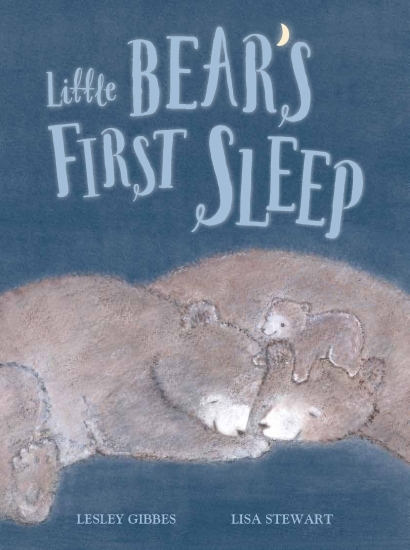 Little Bear’s First Sleep is a gentle picture book story about – of course – bears, and sleep, but also about navigating rites of passage towards independence. With his parents asleep, Little Bear must solve his dilemma for himself, but it is with the knowledge that his aprents are close that he finally does so. The illustrations, using soft colours in watercolour and gouache, are just beautiful, and teamed with the gentle text make this a lovely bedtime story. As the sun goes down, desert babies get ready to sleep – quolls cuddled up in dens, frilled-neck lixards hidden in mulga trees and emu chicks snuggled with their father in their nest. 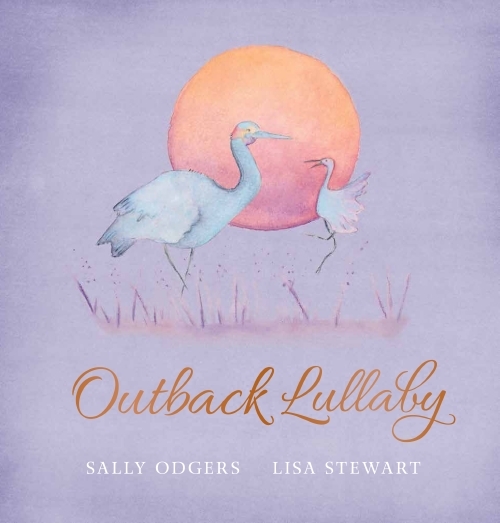 Perfect for bedtime, Outback Lullaby is the third lullaby title from the team of Odgers and Stewart and is perfect for babies and toddlers.